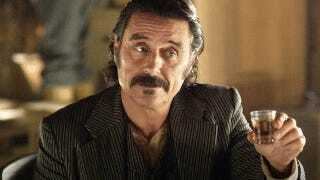 If you haven't seen the brilliant HBO series Deadwood, well, go watch it. But if you have seen it, then this video is just for you. In honor of the show's 10th anniversary (side note: ten years! ), RogerEbert.com critic Matt Zoller Seitz has made this video essay about the show. It was edited by Steven Santos and narrated by Ellsworth himself, Mr. Jim Beaver. It's enough to make me want to throw in the DVDs and watch the whole thing all over again, only to stop midway through the third season because I can't bear to see it end with so many stories unresolved. Luke also tells me that if you're really into the show, you'd do well to check out the book Deadwood: Stories of the Black Hills, which he calls "one of the best TV books you'll ever read." Something something cocksuckers something. Enjoy!